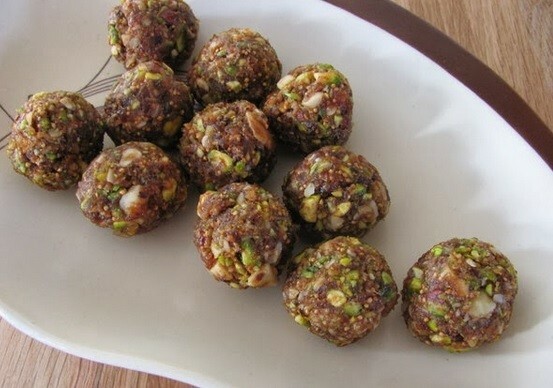 These bite size raw maca energy balls are packed with succulent dates, wholesome nuts and seeds, and a liberal serving of organic maca powder. Organic maca powder is made from the dried root of the maca – a tuber crop native to the high Andes of Peru where it is known as the ‘aphrodisiac of the Andes’ and was once used as a means of means of payment and to settle taxes. The Pumpush, Yaro and Inca people have all used maca as both a valuable source of food and medicine for centuries – during Inca times for example, maca was supplied to warriors to boost their energy, strength and alertness. And today local shamans still believe that the consumption of maca will encourage a person’s spirit to descend to earth in order to reincarnate. Organic maca powder is a totally natural product that comes in a variety of colours, ranging from matte white and yellow to red, purple and even black. It is absolutely loaded with beneficial nutrients, including vitamins (B1, B2, C, E), minerals and trace elements (calcium, potassium, magnesium, sodium, zinc, copper, selenium, manganese, tin, iodine, phosphorus, sulphur, silicon and bismuth), complex alkaloids, fatty acids and sterols. Whilst it’s just made for stirring into your favourite smoothies, shakes, protein drinks and nut milks, organic maca powder is also an extremely versatile kitchen ingredient that can be used to enhance a large range of rawfood meals and snacks, including our yummy raw maca mojos below. - 1/2 tsp. of Himalayan pink salt. First place the pumpkin seeds, sunflower seeds, chia seeds, pistachio nuts, Himalayan pink salt and organic maca powder into a blender. Grind into a coarse mixture where all these ingredients are incorporated and well mixed in together. When you have reached the consistency mentioned above, now add the dates into the blender. 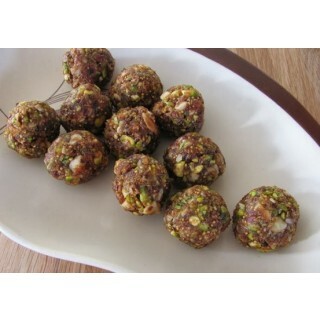 Continue to process with the added dried dates, gradually pouring in the water until it forms a rich dough. Finally roll the mixture into balls of desired size. For a firmer texture add less water and put into a freezer for 30 minutes.